Ben 10: Ultimate Alien is the most recent series in the Ben 10 television series’, having ended in March of 2012. Featuring a 16 year old Ben Tennyson, the series sees Ben with an improved Omnitrix, called the Ultimatrix, as well as becoming known worldwide for his power and abilities. Becoming known for being a superhero has it’s downsides though as Ben continues to face bigger threats, but also gains the ability to use improved Ultimate forms of some of his alien forms. 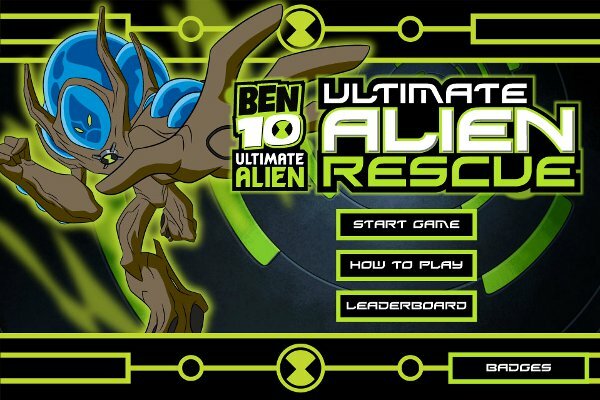 Ben 10: Ultimate Alien – Ultimate Alien Rescue is an online flash game made for the series and is available on the Cartoon Network website. 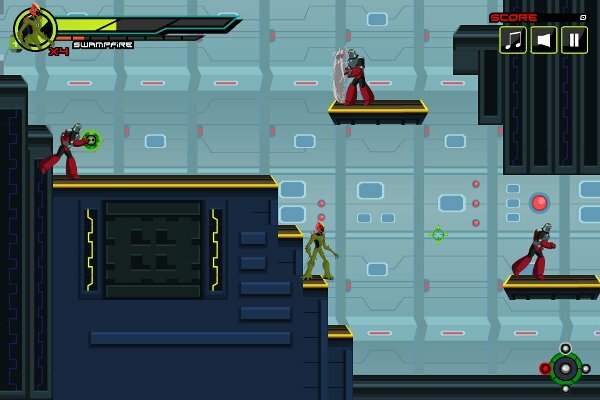 As with most flash games based on a series, it attempts to fit into the story of the series or is based on one or more episodes. With Ben 10 being such a hot property does the game live up to what fans of the series would expect? The story this time around is that 5 aliens, after having crashed onto Earth, are on their way back to their homes when they get captured by the evil Aggregor. Technically, this happens in the Ultimate Alien series proper, but the way it is executed makes the game pseudo exist between the episodes “Fame” and “Escape from Aggregor”, in that Ben 10 luckily finds out about it and heads up to save them, but in the end as Aggregor puts it “No one escapes me.” What this does is that ultimately what the player does in the game feels unimportant, but on the other hand doesn’t upset any canon of the actual series, so it is really a trade off. Unlike other games, Ultimate Alien Rescue features an opening and closing, as well as dialogue in each level albeit incredibly limited. This is actually pretty nice to see in a flash game where many others have maybe a few panels explaining the story in the best case. These are not by any means overly in depth, but each of the characters appears to actually have character, instead of just stating “Thanks, now save the next guy” four different ways. 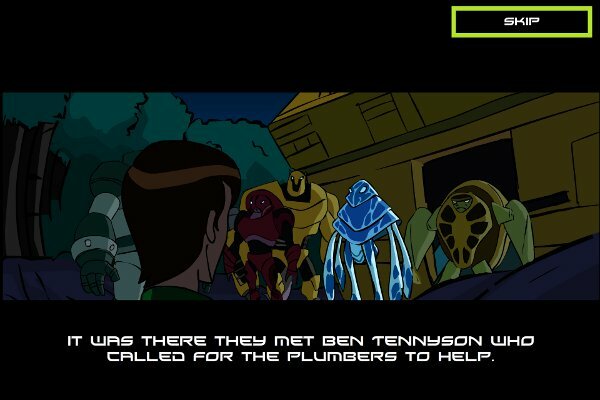 Who knows maybe a flash game for the next Ben 10 series will actually have voice over dialogue. The game plays like a standard platformer for the most part, where players get to utilize Swampfire or sometimes even Ultimate Swampfire. In addition to, since playing as Swampfire, the mouse can actually be pointed at enemies and fire fireballs while moving along. This is a solid concept in theory, but all of the enemies in the game have a lot of health, and many fire back, so trying to kill everything will generally end with be killed unless dodging constantly. 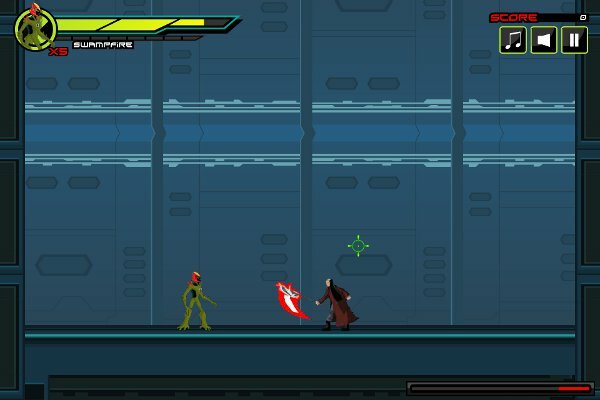 Making the best course of action to simply jump past and around enemies and attacks, only utilizing attack itself in boss fights. The design in each level is pretty much a maze, which scales bigger and more branching in later levels. Unfortunately, the game is designed mostly linear as Swampfire can only really head to the key, which opens a door, which has a key for the next door, etc. until reaching the alien on that level. So, younger players will probably run around a lot taking different paths until finally actually find the one that has the next door and key, making for a longer game where the only excitement is avoiding all the things enemies are firing at them. There are a few boss fights as well, which instead of having int he same maze style room arrangements simply is in an open arena, which makes it easier to dodge attacks and fight away at them, but can be hard to dodge different attacks, luckily dying doesn’t revert boss health to ease these battles for the younger crowd. Besides keys and thankfully health pickups, Swampfire can grab 1ups for extra lives and Ultimatrix pickups which power the ability to turn into Ultimate Swampfire. While hitting harder, the power will drain away while playing as Ultimate Swampfire until back as regular Swampfire again and it’s really a good idea to just use it when even possible as getting hit as Swampfire drains Ultimatrix power as well as health. A good way to break up monotony, but not necessary to get through the game. This time around there is no voice over work at all, but players are only using Swampfire and Ultimate Swampfire in the actual game so it’s fine as he probably wouldn’t have all that much to say. It would have been nice if the short little dialogues were voiced over, but I suppose it was more surprising that they were there and that might be asking too much. Music on the other hand works out pretty well, it changes throughout different scenes, so there’s less likely to get stagnant unless stuck in the same level for way too long, but since the music is really the only audio, besides attacks and pickups, muting is an option, no literally you can just click Mute at the top. 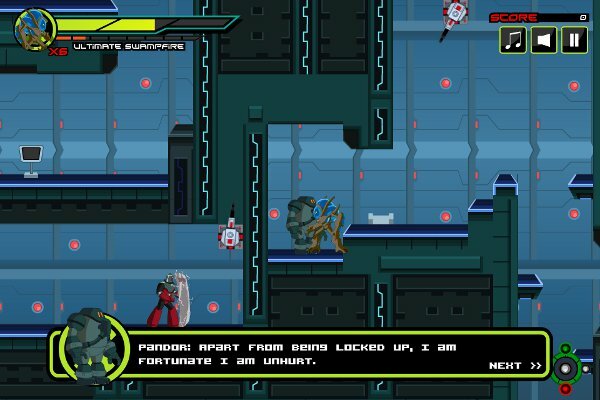 The visual style is generally good with Ben 10 games as the art style is easy to match and this is no different. Unfortunately, because the entire thing takes place in the same spaceship visuals get old pretty fast. After seeing one maze and the 4 different enemy types, you’ve seen all of them. It does look nice, but it would have been nice to see a little bit more as there were 5 different levels and 2 boss fights, which where practically the same.